City Financial Planning needed to store their boxed archive files which were taking up valuable office space in an offsite secure storage facility with fire and intruder alarm protection. We collected 500 boxes of files and took them to our secure processing facility, where we repaired or replaced broken boxes and listed all files contained in each box, recording client names, postcode and IFA consultant. We returned all data to City Financial Planning as an update-able database. Staff can now retrieve a box, a file from a box or a document from a file on demand and we return it as a hard copy or as a scanned document, usually within 24 hours. We were asked to provide a managed storage solution to a West Country food processing organisation who supply large premium brand supermarkets. It was vital to them that hard copies of the product ingredients stored in the boxes could be provided to supermarket auditors within a 4 hour window of request. 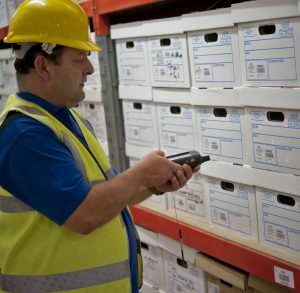 We collected over 700 boxes, the contents of which had been catalogued by their staff and entered them into our racked and barcoded storage bays in barcoded boxes enabling extremely fast and accurate retrieval at short notice. The retrieved files/boxes are then delivered by hand using our own uniformed staff and vehicles often within 2 -3 hours of request. The company regularly add 20 – 30 boxes per month to their stored boxes as their business grows.